Thread in 'Discussion' started by Archina, 23 May 2015. 1. What exactly does this red box mean? 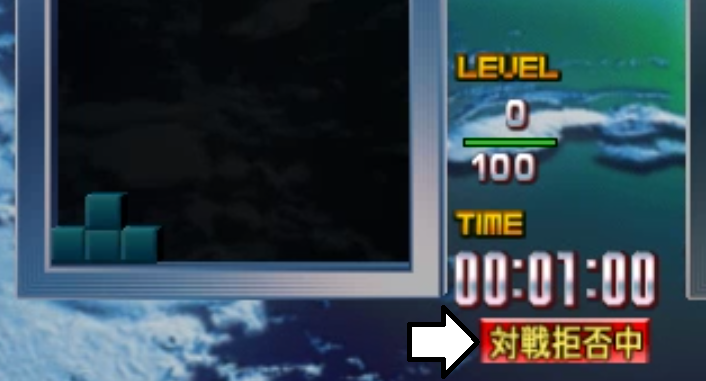 It seems to do something to the player 2 slot but I can't read Japanese so I have no clue what it says. 2. What exactly is the difference between Classic and World? I don't seem to notice much difference between the two besides the tetrimino colour and button settings. I prefer clockwise rotation (which World has 2 buttons for) yet everyone seems to say it's worse so I'm curious as to why it is. 3. Is there any way to fix this resolution bug? I've tried to search it yet the problem is so vague I can't seem to find any answers for it (using 1920x1080.) The 4:3 resolution is fine on my laptop though (It uses 1280x768 ) or is there another place I can obtain TGM3 from (either a playable board or windows-compatible software) besides from here (Edit: Link Removed)? Edit: Whoops, forgot to add the image. The red box means "no challenger", it's toggled by pressing start, and automatically enabled during promotional exams. It makes it so the other player can't challenge you to versus when they play. Ah, I was assuming it either disabled vs or disabled the second slot alltogether. Thanks for clarifying. 3. Is there any way to fix this resolution bug? I've tried to search it yet the problem is so vague I can't seem to find any answers for it (using 1920x1080.) The 4:3 resolution is fine on my laptop though (It uses 1280x768 ) or is there another place I can obtain TGM3 from (either a playable board or windows-compatible software) besides from here? 2. Classic is faster and harder (the tetrominoes respawn is different and it changes greatly the difficult while stacking). World is not that fast and is more "friendly", you can keep rotating the tetrominoe more than using Classic rotation system. There are certain moves which are only possible for one rotation system or the other. 3. Dude, delete the link to the download source (my blog xD), please. We can't post copyright download links in this forum. Regarding the resolution issue, I had the same problem with my new LCD at 1920x1080. I could fix it, but I must make clear that I have an AMD Video Card, so I don't know if this is fixable on other video cards. I went to AMD Catalyst Control Center, and Digital Panels (or whatever it's named in English), Properties, and I activated GPU scaling. Ah. I guess that explains why I always got higher scores on World then. I just assumed it was because of my favoured rotation being on two buttons instead of one. I still have a lot of improving to do though as my fastest time to level 500 is ~10 minutes when I need 7 to pass it.